Hello, my Puddlers, in case you didn't notice, the Puddles of Myself team took an unofficial "spring break" this past week in order to recharge our jets. However, today you will get a double dose of Erik Lilleby and his "thoughts" on the two most recent episodes of Community. Let's just say that you will be reading words when you read the words that he wrote. We'll be back next week with new content and I can guarantee that you will be either moved or disturbed by what you read. Based on my marketing research, "moved" or "disturbed" are the two most common reader reactions to Puddles of Myself. Who knew!? The important announcement regarding the upcoming Fifth Season of Mad Men is that, to paraphrase Chris Farley, "it's gonna be awesome." I'm literally as giddy as a schoolgirl on Easter night (is that a thing?). Also, I will be taking my Puddles of My Mad Men talents over to The Montreal Review each Monday, where they will edit and post my reviews of each episode of the Fifth Season. Of course, I'll provide links to you all. In order to get you amped up for Sunday's two hour season premiere, here is the Season Five primer I wrote for the Montreal Review last month. Take a read and remember that each time Don mutters or states the phrase "I do," this Sunday, I will be doing it the same way at work the next day, and furrowing my brow just as handsomely. 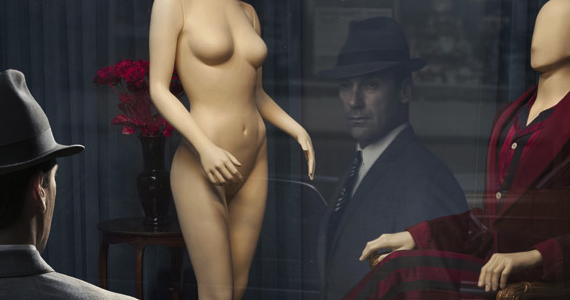 Once more, the link to my Mad Men Season Five Primer.